Aortopulmonary collaterals (APCs) are occluded either preoperatively or at the time of cardiac surgery in patients with pulmonary atresia and ventricular septal defect (PAVSD). If left untreated, APCs are an important cause of deterioration in the early postoperative period. We present here an unusual case with a large residual APC causing refractory low-output state in the early postoperative period. Usual arterial approach failed due to extensive angulation with ostial narrowing. 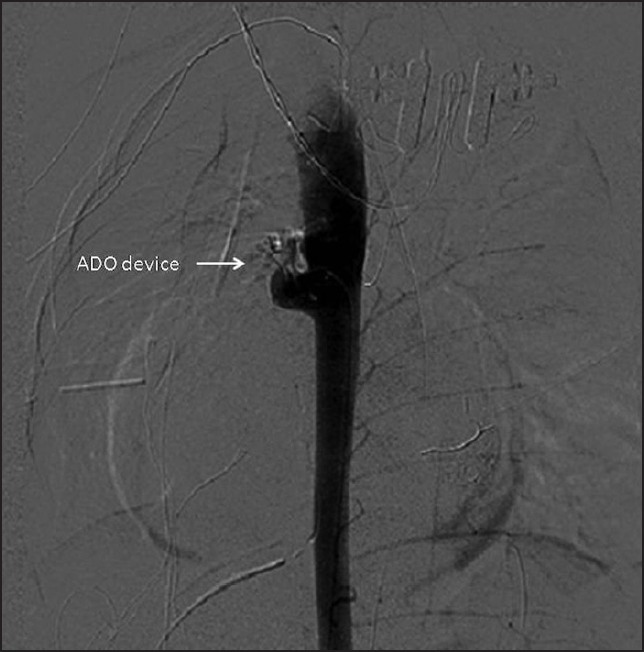 The large residual APC was successfully closed with an Amplatzer duct occluder (ADO) device delivered through the transvenous route. Multiple aortopulmonary collaterals (APCs) are commonly observed in patients of pulmonary atresia and ventricular septal defect (PAVSD). ,, APCs that are not required for unifocalization are occluded either preoperatively or at the time of cardiac surgery. If left untreated, APCs are important cause of deterioration in the early postoperative period. APCs are percutaneously occluded using a variety of devices including expandable balloons, liquefied gelatin, umbrella-type devices, coils, Amplatzer vascular plugs, and Gianturco-Grifka vascular occlusion devices. 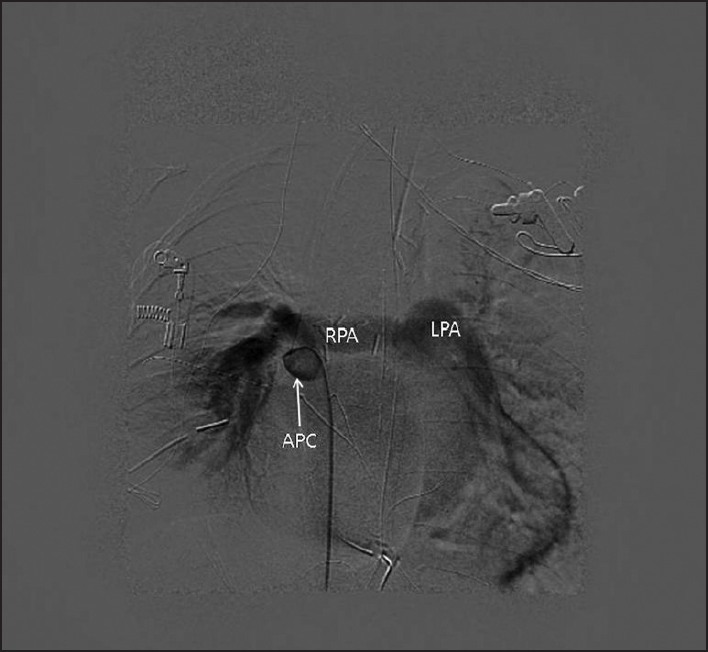 ,,, We present here an unusual case with a large residual APC causing refractory low-output state in the early postoperative period, which was successfully closed with an Amplatzer duct occluder (ADO) device delivered through the transvenous route. A 3-year-old male child, weighing 8 kg, diagnosed with PAVSD underwent complete surgical repair. Cardiac catheterization prior to surgical repair showed bilateral confluent adequate size pulmonary arteries filling through multiple large APCs from the descending thoracic aorta (DTA) [Figure 1] and the child underwent gel foam/coil embolization of multiple APCs. Three sizable APCs could not be closed percutaneously because of technical difficulties and closure was planned at the time of surgery. Alternatively, either an axillary approach or a transvenous approach into the ascending aorta from the right ventricle through the overriding VSD could have been tried. Surgical repair involved ligation of APC and total correction with placement of pulmonary artery homograft. In the immediate postoperative period, the patient developed features of low-output state refractory to conservative management. Echocardiography showed absence of residual VSD or significant right ventricular outflow tract (RVOT) obstruction. There was complete diastolic flow reversal in the DTA, suggesting the possibility of large residual APCs. Patient was taken to the catheterization lab and a DTA angiography showed persistence of a large APC filling bilateral pulmonary arteries. The APC was hooked with a 5F Picard catheter (Cook, USA) and a 0.035" Terumo glidewire (Terumo, Europe) was passed across the collateral into the right pulmonary artery. However, no diagnostic or guiding catheter could be advanced across the ostium of the collateral due to the severe angulation [Figure 2] and [Figure 3]. This precluded the use of vascular plug or coil closure of APC through this approach. As the APC was large in diameter and was in direct communication with the pulmonary artery, it was decided to use a transvenous approach through the pulmonary artery side to close the APC with a device. A 6F Swan-Ganz catheter was advanced into the pulmonary artery from the venous side through the conduit gently over a Terumo glidewire so as to avoid injury to surgical anastomotic sites in RVOT. The APC was re-hooked from the arterial side with a Picard catheter and a 0.035" Terumo glidewire was passed across the collateral into the pulmonary artery. This wire was snared using a Microvena snare (Microvena corp. MN, USA) and exteriorized from the venous sheath. Thus, an arteriovenous railroad was created through the collateral and pulmonary artery. 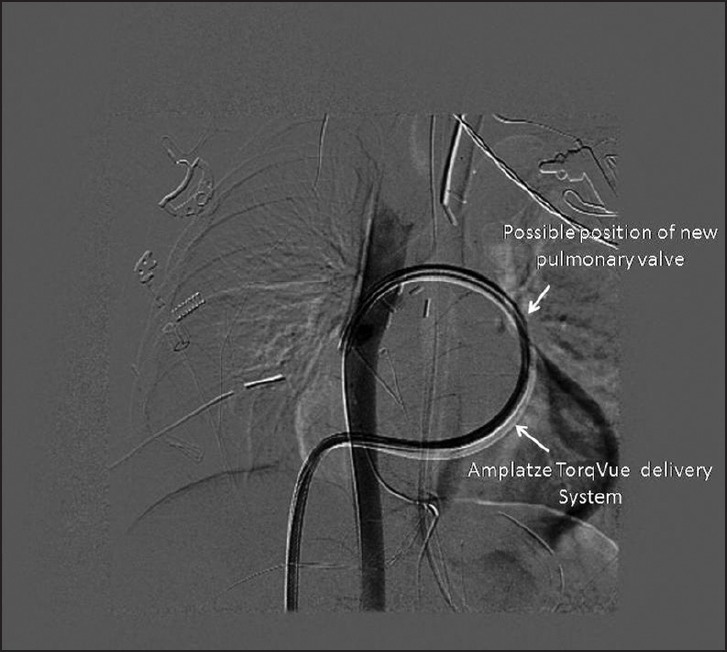 A 6F Amplatzer PDA delivery sheath (180° Curve Amplatzer TorqVue Delivery System, Amplatzer Inc, MN, USA) was advanced with difficulty from the venous side through the conduit, pulmonary artery, collateral, and then into the DTA [Figure 4]. Using this sheath, a 10 × 8 mm ADO device was deployed in the APC successfully. 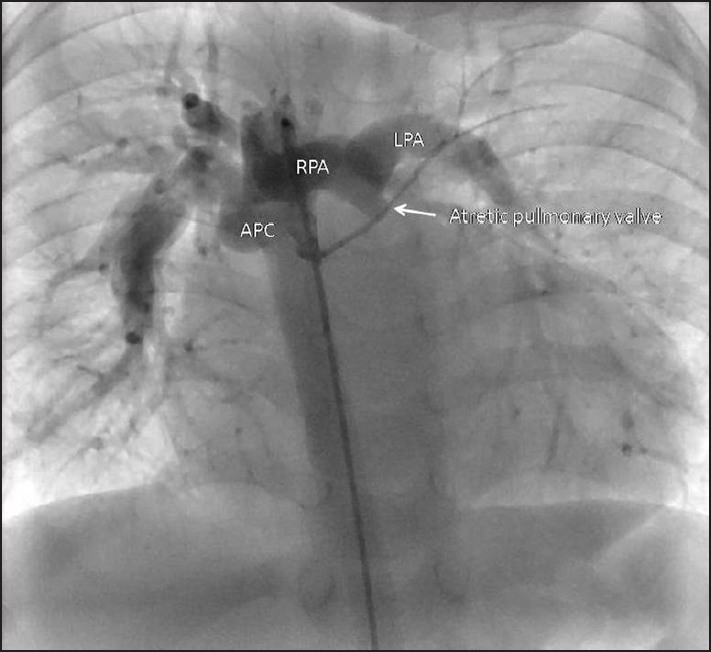 Angiography showed good position of the device with no flow across the APC into the pulmonary artery [Figure 5]. Patient was successfully weaned off the ventilator in the next 48 h and was later on discharged from the hospital after 7 days. At a follow-up of 8 months, patient is doing well with no residual surgical problems and has gained 3 kg in weight. Coil occlusion or surgical ligation of large APCs is the standard procedure prior to total corrective surgery in PAVSD. Postoperatively, residual APCs can result in persistent low output state and/or hemoptysis, and contribute significantly to morbidity. In our case the residual APC led to refractory low cardiac output state in the immediate postoperative period. Such residual APCs causing refractory heart failure are well-documented in literature and are usually closed with multiple coils, gel foams, or vascular plugs delivered through a catheter placed in DTA. We also tried closing the APC from the aortic side, but we could not pass the guiding catheter across the APC due to severe angulation. The alternative options were to use an axillary approach or ligate the APC surgically. Axillary approach would have given a better angle and would have allowed the passage of a catheter across the APC. However, the shock state, age of the patient, and need for use of a larger sheath prohibited an axillary approach. The morbidity and mortality associated with a repeat surgery was perceived to be high due to refractory shock state of the patient and possibility of failure to identify the particular APC during surgery. Surgically, collaterals arising below the carinal angle are difficult to loop and may require lateral thoracotomy. An antegrade approach from the pulmonary artery side turned out to be an excellent alternative. As the APC was in direct communication with the pulmonary artery we could safely advance the ADO device with its delivery system through the APC into the DTA without causing any trauma to the pulmonary arteries and the newly placed conduit. The intervention procedure was similar to placing an ADO device in patent ductus arteriosus. Technically once railroad was created, we could have advanced the catheter from the aortic side, but the transvenous approach allowed the safe use of a larger sheath. The other option would have been to use an exchange catheter from the aortic side and change the Terumo wire for a stiffer wire, which could have enabled the advancement of catheter from aortic end itself. To the best of our knowledge, we report here the first case of transvenous closure of a large residual APC with an ADO device in a child of operated VSD and pulmonary atresia with cardiogenic shock. 1. Liao PK, Edwards WD, Julsrud PR, Puga FJ, Danielson GK, Feldt RH. Pulmonary blood supply in patients with pulmonary atresia and ventricular septal defect. J Am Coll Cardiol 1985;6:1343-50. 2. Ramsay JM, Macartney FJ, Haworth SG. Tetralogy of Fallot with major aortopulmonary collateral arteries. Br Heart J 1985;53:167-72. 3. Rabinovitch M, Herrera-deLeon V, Castaneda AR, Reid L. Growth and development of the pulmonary vascular bed in patients with tetralogy of Fallot with or without pulmonary atresia. Circulation 1981;64:1234-49. 4. Kinoshita M, Shimizu K, Toda Y, Suzuki S, Suemori T, Iwasaki T, et al. Postoperative coil embolization of residual MAPCAs greatly improved left heart failure in a patient after corrective surgery for pulmonary atresia, ventricular septal defect and MAPCAs. Masui 2010;59:1441-5. 5. DeSouza NM, Reidy JF. 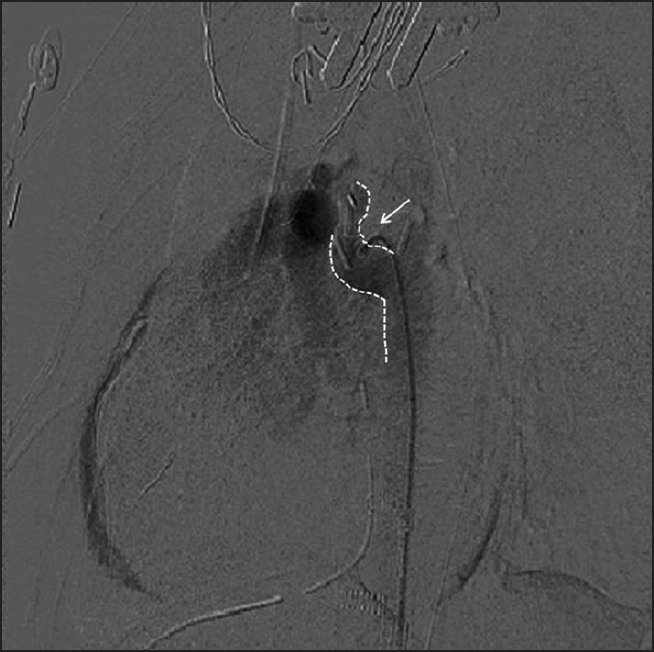 Embolization with detachable balloons - applications outside the head. Clin Radiol 1992;46:170-5. 6. Qureshi SA, Tynan M. Catheter closure of coronary artery fistulas. J Interv Cardiol 2001;14:299-307. 7. Ebeid MR, Braden DS, Gaymes CH, Joransen JA. Closure of a large pulmonary arteriovenous malformation using multiple Gianturco-Grifka vascular occlusion devices. Catheter Cardiovasc Interv 2000;49:426-9. 8. Ito T, Suzuki T. Transcatheter embolisation of pulmonary collaterals using liquefied gelatin. Pediatr Int 2003;45:475-7.